For several months now, at every weekend Masses, we have been reciting the Prayer of Consecration to the Blessed Virgin Mary, Star of the New Evangelization. We continue to implore our Blessed Mother's intercession for a "mighty renewal of the Catholic Church in Singapore". We also pray for "all hearts to be converted and re-ignited with love for Christ and inflamed with evangelical zeal." With this Prayer in my heart, I invite all of you to A RENEWED PERSONAL ENCOUNTER WITH JESUS - our pastoral programme for 2015/2016. 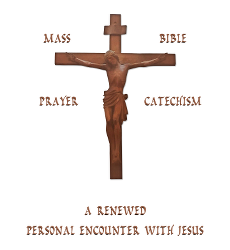 Through MASS, BIBLE, PRAYER, CATECHISM, these four channels lead us to encounter Jesus intimately and to experience God's love for us. This programme is for everyone. As our Holy Father Pope Francis said : “no one is excluded from the joy brought by the Lord". The Parish Pastoral Council (PPC) together with several Ministries have planned this pastoral programme in such a way that there is no need for you to register for a course, to attend a retreat or evening classes. All that is required from you is a modest commitment of your time. The programme is flexible and you do it at your own pace. You can start small and slowly add to your commitment. The most important thing is to start, to "take a step towards Jesus". I also urge you to introduce this programme to your relatives and friends who have stopped coming to Church and are struggling with their faith. This is an excellent opportunity for them to re-discover the joy of encountering Jesus. Click the section header below to read the full message. While we all desire to spend more time with God, the reality is that for many of us, because of the distractions of daily activities, relationship with God ends up at the bottom in our list of things to do. This hinders us from receiving the full instalment of God’s grace which He wants to give to us each day and as a result, our love for God cannot flourish. The programme materials will be communicated through our church website (www.svdp.sg), available 24/7, so that you can access them at your own time and convenience. The information is kept simple, concise and relevant so as to cater to everyone. You can do this programme on your own or better still, journey together with your family, neighbourhood group or Ministry so that you can provide mutual support and encouragement to one another. Let us all go forth to encounter Jesus and to experience God's love for us through active participation in Mass, daily reading of the Bible, daily communication with God in prayers and an understanding of our faith. This renewal of our faith is essential for our spiritual growth, so that we can bring the joy of the gospel into the world. All of us are called to bear witness through our daily Christian living, so that through us, all shall come to seek Jesus Christ and have eternal life in Him. 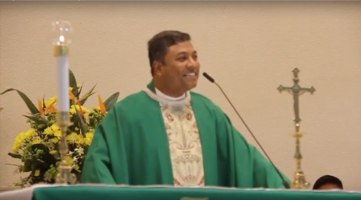 From July to September 2015, we focus on the first Channel - the Mass. While we do not disrespect the Mass on purpose, it is often simply a case of being distracted or going through the motion with a vague understanding of what we are celebrating. Every Mass is a unique privilege of a personal encounter with Jesus Christ : to meet Him, to listen to Him and to receive Him. But we need to give ourselves completely to the Lord for Him to act in us. In six, roughly 10-minute episodes, a video guides us through the various parts of the Mass and prepares us to participate more fully and appreciatively in this beautiful and beloved celebration at the heart of our Christian life. Read a summary of all episodes here. If we attend weekly Mass and do nothing else, we are spending as little as less than 1% of our time each week with God. We need to meet with Him daily and to spend a lot more time with Him if we truly want God to make a difference in our lives. Reading the Bible is an excellent way of encountering Jesus and allowing His joy to be constantly born anew in us. In the second Channel, from Oct to Dec 2015, we make a renewed effort to overcome our inertia of opening the Bible and to cultivate a lifelong habit to read, to meditate and to pray God's Words daily. This intimate form of communication with God was a habit with Jesus and it needs to become a habit in our life. Prayer is the lifeblood of Christian discipleship. Without a prayer life, we cannot hear God speaking to us and our hearts and minds will not be open to receive His love and mercy. The third Channel provides us with simple advice and practical steps for strengthening our relationship with God through prayers. We explore the different options of praying and also ways to overcome distractions and dryness. What do we Catholics believe about Angels? Virtues? What does the Church teach about Mary? The Second Coming? Faith in God is primary and paramount. But we should not say “I have faith, so I don’t really need to understand.” or assume that receiving Confirmation prepares us with everything we need to know about our faith. The fourth channel initiates us to a lifelong journey of faith seeking understanding as we open ourselves to the power of Holy Spirit who "will teach us everything" (John 14:26).